Today we are happy to partner with Scholastic Books and talk about preschool readiness. Scholastic has some great resources for parents, including their Parents Website (visit the site HERE), full of helpful articles, lists and resources for children, from preschool on up. It’s back-to-school time and the importance of quality preschool readiness is top of mind with parents and teachers--–President Obama included it in his State of the Union address; New York City Mayor Bill de Blasio has committed to serving expanding pre-K access to 50,000 students this year; and the American Academy of Pediatrics recently announced a new policy prescribing reading aloud to children as early as birth. 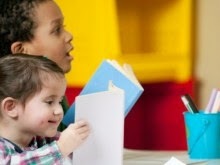 Research shows from as early as the first months of life, children’s experiences with oral-language development and literacy begin to build a foundation for later reading success (Duke & Carlisle, 2011; Dickinson & Neuman, 2006). So what do parents need to know to help their child be preschool ready? (Some resources, press release link: http://bit.ly/1BeavlM). Scholastic is here to help and provide the best books for preschool children! Here are some highlights of the latest Scholastic Reading Club offerings and new book titles that will pique the interest of the pre-school audience. New age-appropriate books for infants, toddlers and preschool students, including board books, novelty books, hardcover picture books, paperback titles, and coloring/activity books. New titles available for fall 2014 include Clifford Visits the Zoo, Dinosaurumpus, Peppa Pig: Ballet Lesson, The Night Parade and more. Scholastic offers special Preschool Book Fairs nationwide, featuring a wide selection of carefully selected books for children ages birth to 5 years, including popular series, award-winners, new releases and other titles that will ignite young imaginations and instill a love of reading. I've requested a couple of the new titles, so check back soon for my reviews of Clifford Visits the Zoo, and Peppa Pig: Ballet Lesson!